A post-walk soak at Gunlom Falls, Kakadu (photo: Jennifer Pinkerton). 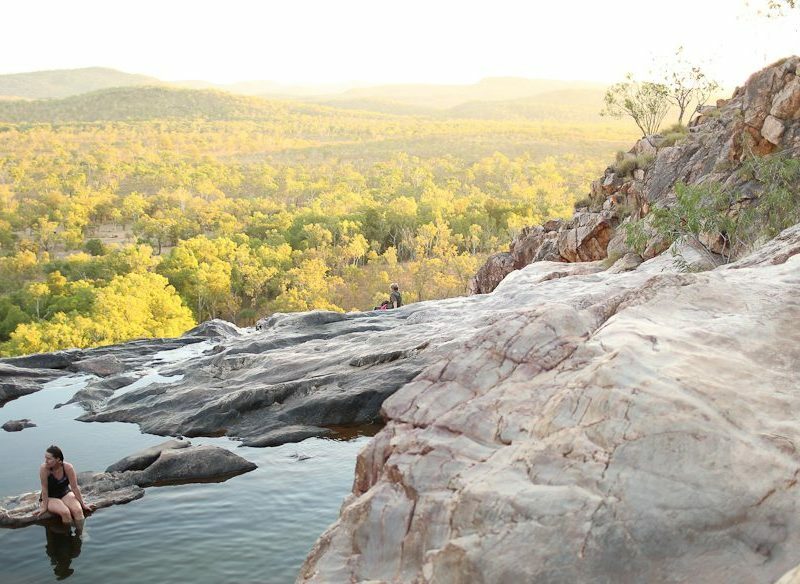 Kakadu National Park is a mini-world that’s better explored on foot than on wheels, and better swum inside than feared from the water’s edge. Here are our picks on the best walking and hiking in Kakadu. I’m lost inside a technicolour canvas. Really lost. And I can’t recall having popped LSD. Before me lies a charcoaled ground. It’s carpeted in burnt sticks and logs. Ahead, fluorescent green regrowth bursts from branches, caramel-toned kangaroo paw drapes at elbow-height and refracted purple light cuts angles in the air. I’ve been bopped with the beauty gun – as is wont to happen in Kakadu. I gasp, freeze, delight, linger. Until eventually, I lose sight of my walking group. On the march back from Maguk, Kakadu (photo: Jennifer Pinkerton). “Cooooeee!” I call, channelling a slightly bedraggled and far more ocker Alice in Wonderland. I search for a clearing beyond this enchanted slice of bush. Ten strung-out minutes tick by. I fret, stress and maybe catastrophise a little. Finally, relief slides into view. Emerging from a thicket of eucalypts, a walker appears in perky pink shorts. It’s Michele, one of our hosts from touring outfit World Expeditions. “Day Two and you’ve already earned the nickname Little Miss Walkabout!” she shouts merrily. My cheeks turn the shade of Michele’s shorts and I gallop over to her, vowing to keep my eyes on the prize for the remainder of the trip. Along with nine other hikers, I’ve voyaged to Kakadu to explore the bounties of the world’s largest terrestrial national park on foot. Over five days, we’ll tread 45 kilometres and spend four nights under the stars, sleeping in semi-permanent tents. I’ve visited Kakadu before, but with my own wheels in tow – as is the case for most travellers who venture to this neck of the Top End. In an instant, walking slows the pace to a comfortable and steady heartbeat. Instead of spinning along Kakadu Highway to park the car, strolling a few hundred metres and going camera crazy at A) a lookout, or B) a swimming spot, the act of walking morphs time into something rather liquid. I’m experiencing a new level of absorption with my surrounds. There’s space to stop, exhale and notice the little things – which, granted, can land you trouble if you trade in high levels of vagueness. Meditative contemplation is permitted; however, when we reach the highest point of today’s trail, the 12-kilometre Barkk Sandstone Walk at Nourlangie Rock. While the trek begins in a shady chain of rock art galleries, their floors stamped with salmon-coloured leaves, the trail quickly lifts to a steep ascent. After passing bouquets of pandanus, we emerge at a giant rock shelf. The rugged stone country around us is ringed with behemoth boulders and cube-shaped towers of grit. The latter resemble Mayan ruins – a sight that continues as we traverse the escarpment, then descend into lusher terrain. Before we do, though, the group silently drinks in this breath-seizing view, each walker claiming their own peaceful place to perch and ponder. Over a lunch-time salad platter, which we roll into wraps, guide Dan Rose points out tucked-away rock art. Images of waterbirds, turtles and snakes hint that this area was once close to the sea. “These paintings are an encyclopaedia of all the dramatic changes Kakadu’s been through, culturally and environmentally,” he says. We let the ancient art distract us for a while, before our thoughts turn to the journey ahead, which tonight will continue in the form of a two-hour cruise on Yellow Water Billabong. The next morning we wake under nets of dappled light to a chorus of singing birds. Today we’ll venture further south to waterhole territory. The plunge pool at Maguk Gorge, Kakadu (formerly known as Barramundi Gorge). First stop: Maguk. After scrambling over boulders to reach the water’s edge, our group erupts into a squealing frenzy. We sound like a litter of piglets, part thrilled, part spooked. “How do we know this is croc-free?” a voice shrieks. Dan cancels out concerns by wading into the sparkling lagoon. One by one, the rest of us follow. Though before plunging in, some cling to dry land for what seems like a shameful misuse of minutes. While Maguk’s teal swimming hole, with its towering backdrop of black stone and neat guard of pandanus trees, is hard to beat, this evening’s itinerary throws up paradisiacal rivals. As the sunlight starts to fade, we arrive at Gunlom. Here, a waterfall travels through a copper escarpment, plunging 100 metres to a waterhole below. To reach the network of infinity pools perched at the top, you have to work for it. So, with an hour of light remaining, five of us puff a path to the peak. Then, as the sky fades and the rocks blush in the twilight, four begin the descent. “Sure you’ll be right?” one companion asks, before venturing out of sight. “Yep, yep,” I reply, eager to nab some alone-time. Floating in a pool nearest to the cliff edge, I luxuriate in the thought that Gunlom trumps any hotel pool I’ve visited. Buxom clouds reflect their shapes in the water’s surface and, beyond, an endless quilt of trees shift from green to gold in the dying sun. All this lingering will, of course, cost me further cred with the group. “Heeeeeeeere she is!” sings Dan when, eventually, I skulk back to camp. Walking back down from Gunlom Falls, Kakadu, at dusk (photo: Jennifer Pinkerton). A new morning dawns in which to prove my bush savvy. We’re trekking the 14-kilometre Yurmikmik Circuit past Motor Car Falls, which draw their name from a mid-century mishap. A poor bloke, a tin-miner named Paul Allmich, was the first to try to cross this area on wheels, but his Chevrolet tyres sunk deep into the mud, bogging his truck. We’ll walk the same track followed by his ill-fated Chevy, looping out to Kurrundie Falls, then returning via Motor Car Falls. Upon our arrival at the latter, we unfurl atop a rock to lunch, lounge and peer at the water’s residents – long-armed freshwater shrimp and short-necked turtles. “Ah look!” cries Michele. From stage left, a lacewing butterfly sashays in our direction. It weaves through her legs. Then, like a rising sheet, a cloud of fellow butterflies ascends from a nearby rock. They’ve been feeding on surface minerals. “This is magic,” one walker whispers. Once more, I feel the beauty gun’s target on my forehead. I gasp, freeze, delight, linger. Until, eventually, I lose sight of all that exists beyond park borders. Walkabouts are OK, I figure, as long as they’re confined to the mind. Lunchtime swimming at Motor Car Falls in Kakadu National Park (photo: Jenniger Pinkerton). Some of the group take the opportunity to cool off in the inviting waterhole. Dan, first into the water of course, somewhat breaks the tranquil moment I’m enjoying by splashing water in my direction, startling me with seemingly ice-cool spray. I’m yanked back to Earth. But considering that grounds me right here in Kakadu, it’s not such a bad place to be. I’m happily fixed inside this tropical terrarium – a mini-world that’s sunning my face, pooling at my feet and dancing in the dry-season breeze. Looking for a Trekking and Walking tour provider? Check out our guide to the best Kakadu tours for you.